eLowar was always in charge of the website and installer etc. So I've just dumped the main archive into the zone on eab.abime.net (You have to register on eab to acces the zone). It's set to use the latest version of WinUAE 3.2.2. and I wouldn't recommend using it with versions a lot older than this. It's also designed for GameBase 1.3 which you can get from http://www.bu22.com/. It will NOT work with any earlier versions of GameBase. I'll put the games/music/extras etc onto the eab fileserver (will be under uploads/Belgarath) and I'll also create some dats in a few days. p.s. If you don't want to join eab, I'm sure some kind soul will upload GameBase Amiga somewhere else sooner or later, and hopefully eLowar at some point will update the website. I registered, but i am not allowed to access The Zone!. I have started downloading the Extras from the Belgarth folder, but there doesn't seem to be any "GameBase" files in there. please can you upload the setup with MDB to tinyurl or similar. .mad. wrote: I registered, but i am not allowed to access The Zone!. Belg beat me to it. I should have read the instructions, but never do. Going to merge all the multi-disk games into single archives for my copy. So all the disks will extract to the GBGAME folder. Will upload it as fast as my connection allows. Er you really shouldn't do that...WinUAE handles zips just fine, if you leave them extracted then you could end up modifying the adfs rather than let WinUAE create seperate files for any disk modifications that take place. Thank you so much for an updated Amiga Gamebase. Would you be able to update this thread when you have fully updated the Gamebase on EAB Server. It is fully updated (apart from little things like dats). The SPS stuff I'm not allowed to put on the server but it's probabbly almost identical to the ones in 1.6 as I don't think many more sps were released. The WHDLoads are all available from Retroplay's storage (theres a post by him somewhere) they just need converting from lha to zip which is easily done with something like winrar. I never let GameBase handle the re-zip. When all multi-game disks are in 1 archive. 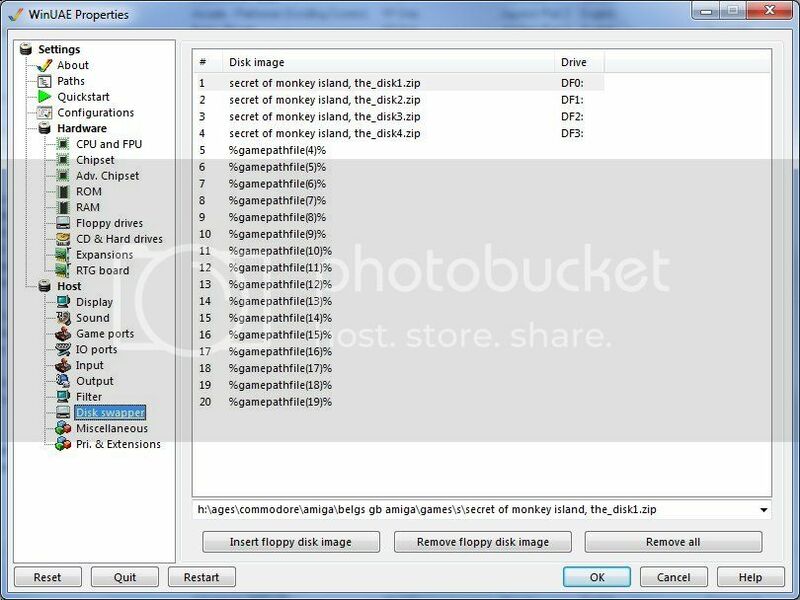 When you play a game all the disks for that game will be extracted to the GBGAME folder making it easier to find the 2nd disk, rather than scrolling through 100's of images. Also with those file names, the script can insert the 2nd disk into DF1: if available. No criticism of your way, but that's how I like it. Ah I see but diskswapping is easy with WinUAE, no need to scroll through 100's of disk images, I don't know if it still works with your way, but if you enter winuae's gui and go to the diskswapper section, you'll see all the zips are automatically loaded into the diskswapper, just select the disk and the drive and away you go. Belgarath wrote: The WHDLoads are all available from Retroplay's storage (theres a post by him somewhere) they just need converting from lha to zip which is easily done with something like winrar. .mad. wrote: When all multi-game disks are in 1 archive. This has been a feature of Gamebase Amiga since the start I think. All multi disk games get extracted and placed in the Disk Swapper feature of WinUAE. When prompted/asked to change disks, hold down END with the corresponding numbered key. (i.e. "Insert Disk 4", would be to hold down END + 4). There are also other keyboard shortcuts to change disks in different drives. How did you not know this ? It's been available for years. Dax, is that the most up to date WHDLoad set? Will this work with GameBase 2.0? It won't work until Belgarath implement it to database (repack/link files, add/update Gemus entries). It is the newest available as "ready to use" package, dated on 2015-08-08. Last edited by dax on Sun Dec 27, 2015 8:44 am, edited 1 time in total.